In Brief: Hepatitis B Reactivation with Direct-Acting Antiviral Drugs for Hepatitis C | The Medical Letter, Inc.
Twenty-four cases of HBV reactivation occurring during treatment with direct-acting antiviral drugs for HCV were identified from the FDA Adverse Event Reporting System and the medical literature.2-5 Before starting direct-acting antiviral treatment for HCV, some of these patients were hepatitis B surface antigen (HbsAG) positive and others showed evidence of resolved HBV infection. HBV reactivation generally occurred within 4-8 weeks of starting treatment. Reactivation of HBV can cause increases in bilirubin and aminotransferase levels, fulminant hepatitis, hepatic failure, and death. Of the 24 patients, two died and one required a liver transplant. HBV reactivation was not identified before FDA approval of these drugs because the clinical trials used to support their approval excluded patients with HBV co-infection. The mechanism by which HBV reactivation occurs during treatment with direct-acting antiviral drugs for HCV is unknown. 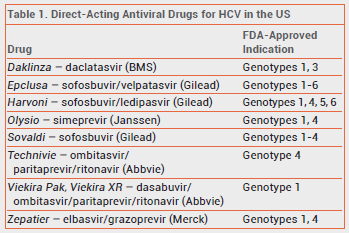 Patients should be screened for current or past HBV infection before starting treatment with a direct-acting antiviral and monitored for HBV reactivation during and following treatment with these drugs. FDA Drug Safety Communication: FDA warns about the risk of hepatitis B reactivating in some patients treated with direct-acting antivirals for hepatitis C. Available at: www.fda.gov. Accessed October 13, 2016. JM Collins et al. Hepatitis B virus reactivation during successful treatment of hepatitis C virus with sofosbuvir and simeprevir. Clin Infect Dis 2015; 61:1304. A De Monte et al. Direct-acting antiviral treatment in adults infected with hepatitis C virus: reactivation of hepatitis B virus coinfection as a further challenge. J Clin Virol 2016; 78:27. AR Ende et al. Fulminant hepatitis B reactivation leading to liver transplantation in a patient with chronic hepatitis C treated with simeprevir and sofosbuvir: a case report. J Med Case Rep 2015; 9:164. C Wang et al. Hepatitis due to reactivation of hepatitis B virus in endemic areas among patients with hepatitis C treated with direct-acting antiviral agents. Clin Gastroenterol Hepatol 2016 July 5 (epub).